Nvidia just revealed the most powerful graphics processor in the world yet again. The next-generation “Volta” graphics architecture made its debut at the annual GPU Technology Conference on Wednesday, jumping off Nvidia’s roadmap and into the real world. But what does that mean for you, a humble PC gamer? Here are five key things you need to know about Nvidia’s Volta GPU. If you’re looking for hot details about the future of GeForce graphics cards, well, keep waiting. Like the Pascal GPU architecture before it, Volta’s big reveal comes in the form of a monstrous Tesla V100 GPU built for data centers. 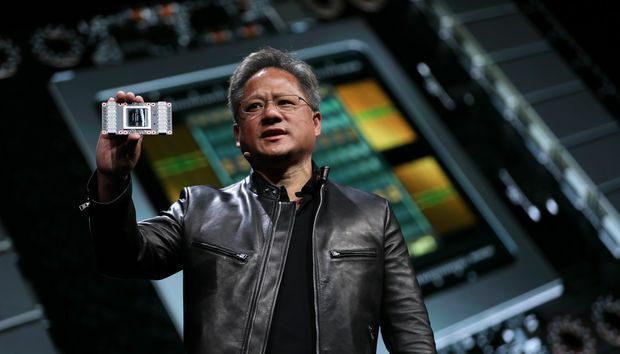 CEO Jen-Hsun Huang focused on the hardware’s AI chops and announced a new $149,000 DGX-1 deep learning system with eight of the Volta processors inside. Big spenders get first crack, it seems. That said, the details Nvidia released about Volta hint at what we might expect from the inevitable next-gen GeForce cards. The Tesla V100 rocks 21 billion transistors and 5,120 CUDA cores running at 1,455MHz. That downright dwarfs Pascal’s flagship data center GPU, the Tesla P100, which packs 15 billion transistors and 3,840 CUDA cores running at a slightly faster 1,480MHz maximum clock speed. The Tesla V100’s Volta GPU. It’s impossible to know what GeForce graphics cards based on Volta will look like, but the recently released Titan Xp wound up with a full-blown implementation of the Tesla P100’s Pascal GPU, and it’s the fastest gaming GPU in the world. Heck, the GeForce GTX 1080 Ti sports a slightly nerfed version with 3,584 CUDA cores and it can still game at 4K resolution without breaking a sweat. It’ll be fun to see how many CUDA cores fit into consumer graphics cards, especially since Nvidia says the Tesla V100 offers 1.5 times the teraflops performance of its Pascal predecessor. For yet another point of reference, this Volta GPU packs four times as many CUDA cores as the GeForce GTX 1060, twice as many as the beastly GTX 1080, and 320 texture units compared to the GTX 1080 Ti’s 224. Nvidia spared no expense preparing Volta’s flagship. The Tesla V100—and presumably all eventual Volta-based graphics cards—use new 12nm manufacturing process technology, an upgrade over the 16nm tech that GTX 10-series GPUs rely on. Smaller transistors mean better performance and power efficiency. The Tesla V100 also includes 640 “tensor cores” designed to greatly accelerate machine learning, and a second-gen version of Nvidia’s NVLink technology, which the company says surpasses PCIe transfer speeds by a whopping tenfold. None of that matters to PC gamers though. A high-level look at the Tesla V100’s specs. What could matter is the Tesla V100’s memory. Like the Radeon Fury series and AMD’s imminent Radeon Vega graphics cards, this data center GPU includes high-bandwidth memory technology—16GB of second-gen HBM2, in fact, with peak speeds of 900GB/s. That’s damned fast. But there’s no guarantee it’ll wind up in GeForce cards based on the Volta architecture. The GTX 10-series relies on traditional GDDR5 and GDDR5X RAM despite launching after AMD’s Fury, and it’s no worse for wear because of it. Nvidia will likely ditch HBM2 and stick with the memory we know for at least some of the inevitable Volta-based GeForce cards given the high price of HBM. Cramming all that technology into a graphics processor is no easy task. The Volta GPU found in the Tesla V100 is massive, measuring a whopping 815mm squared—literally the limits of the GPU fabrication process being used. By comparison, plus-sized GPUs found in Radeon’s Fury cards and recent high-end GeForce chips clock in at roughly 600mm. The Volta GPU inside the Tesla V100 is GARGANTUAN. In any case, there’s never been a GPU this large in a consumer graphics card before. Whether the this gigantic version of Volta appears in the GeForce lineup of tomorrow depends on Nvidia’s willingness to break new ground. Don’t bet on it. Yields must be abysmal with such a huge chip on a new manufacturing process, and consumers won’t pay anywhere near the premium that businesses will for something this radical. The Tesla V100 won’t appear in data centers until the third and fourth quarter, depending on how you’re buying it. Business buyers need time to prepare for big cutting-edge expenditures. But there’s probably another reason why Nvidia’s already showing off Volta: Vega. AMD’s enthusiast-focused Vega GPUs (and the data center-targeting Radeon Instinct) are scheduled to launch some time before the end of June, with Computex and E3 being two likely launch venues. The Radeon hardware offers some intriguing advances of its own, including a programmable geometry pipeline that casts aside unnecessary work and HBM2 paired with fascinating new “high-bandwidth cache controller” technology. How will Vega compare to the GTX 10-series? Nobody knows—but launching the GeForce GTX 1080 Ti at a comparatively affordable $700 and revealing products based on the Volta GPU now leaves Nvidia well-positioned to weather the potential storm. AMD’s Radeon Vega is coming. The real question is when we can expect to see Volta-based GeForce graphics cards. Volta has appeared on Nvidia roadmaps for 2018 in the past, and memory supplier SK Hynix recently said that it’s prepping cutting-edge GDDR6 RAM to ship in high volume on a graphics card in early 2018—though the company didn’t say whether the graphics card is from AMD or Nvidia. It seems unlikely that Nvidia would launch a new generation of Volta GeForce cards so soon after the GTX 1080 Ti and Titan Xp’s release. But hey, the GTX 10-series launched a mere month after Pascal’s release at GTC 2016. We’ll hear more about the next-gen GeForce line-up someday, but whether that’ll be sooner or later is very much up in the air.